Is it entirely unreasonable to expect that Italy's populists in power, though unavoidable, will end up like many governments before them – mugged by harsh reality? 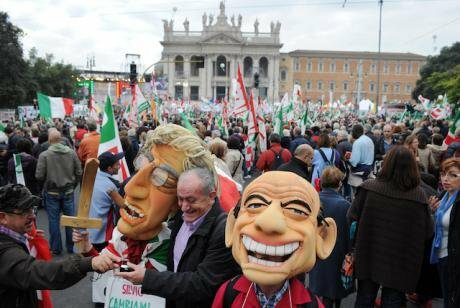 Demonstrators wearing Silvio Berlusconi and Umberto Bossi masks attend PD protest calling for 'Reconstruction. In the name of the Italian people', Rome, November,2011. Eric Vandeville/ Press Association. All rights reserved. One of the most famous clichés in Italian contemporary political historiography is the phrase, lifted from Giuseppe Tomasi de Lampedusa's novel Il Gattopardo (The Leopard), "For everything to stay the same, everything has to change." The recent formation of the first purely populist government in western Europe, a coalition between the MoVimento 5 Stelle and the Lega, satisfies the second part of the phrase. Whether or not it will be able to satisfy the first will have to be seen. The political experience of the past two and a half decades raises serious doubts. Already 25 years ago, in the wake of the Tangentopoli scandals (a reference to the fact that firms that sought to win public contracts had to pay kickbacks to politicians) – a political cleaning out of the Augean stables under the banner of mani pulite (clean hands) dragged Italy through a political revolution that ultimately resulted in the collapse of Italy's main center-right and center-left parties – the Christian Democrats and the Socialists. New political formations filled the void, particularly Silvio Berlusconi's Forza Italia and Umberto Bossi's Lega Nord, as well as the revamped communists. From the political twists and turns that ensued, Berlusconi's Forza Italia emerged as the winner, with substantial support from Umberto Bossi's Lega Nord (LN). It has perhaps been forgotten that the LN joined Berlusconi under the condition that this would lead to the transformation of the Italian state into a federation with substantial rights for the regions, particularly with respect to taxation. After all, the LN had been formed to defend the prosperous northern regions against a rapacious state in the hands of a clientilistic political class that bled the north dry while buying votes in the south. With his raucous voice, crude diction and undeniable charm Umberto Bossi managed to mobilize northern ressentiments against “Roma ladrona and partitocrazia”. As a minister in Berlusconi's government in charge of institutional reforms and devolution, he achieved little. His political career cut short by a heart attack, Bossi suffered the ultimate humiliation when he was compelled to resign from his party offices in the wake of a corruption scandal involving his own family. One might have thought that under the circumstances, the Lega Nord would be finished as a major actor in Italian politics. Italian politics, however, does not always follow the logic of rational choice so dear to American political science. Italian politics, however, does not always follow the logic of rational choice so dear to American political science. Otherwise Italians would not have voted for Silvio Berlusconi, who might have done a great job impersonating a leading role in Italy's commedia dell'arte. As an impersonator of a statesman at the helm of the world's eighth largest economy, however, the convicted tax fraudster and former president of AC Milan (newly-owned by Chinese investors) was clearly out of his league (pun intended). Outmaneuvered in the weeks following the parliamentary election of 2018, Berlusconi saw himself sidelined by Matteo Salvini, the new strongman of Italy's populist radical right. Salvini assumed the leadership of the Lega Nord at the end of 2013. Under his leadership, the party modified its programmatic course, adopting a new winning formula that has brought together clearly defined populist and nativist elements. At the same time, Salvini abandoned the LN's traditional northern focus (and with it, the movement's traditional name), seeking instead to extend and implant the party (relabelled la Lega) across the whole of the national territory, including the south once despised by the leghisti. Salvini's strategy proved highly successful. The secret of the success is undoubtedly the new centrality of nativism, reflected in the Lega's slogan "Prima gli italiani" (Italians first) – a hardly original radical-right-wing populist evergreen, which has, however, proven remarkably effective. Salvini's nativist strategy brought the Lega in line with the preferences of the vast majority of its newly expanded constituency. Recent surveys show that Lega supporters distinguish themselves by their highly restrictive views on refugees, their welfare chauvinism (i.e., the notion that immigrants' access to social services should be severely limited) and their relatively negative views of the process of European integration (in early 2018, only around 40 percent of Lega supporters thought Italy should stay in the European Union and keep the euro). The Lega's nativist program, promising a "common-sense revolution" (la rivoluzione del buonsenso), also brings the Lega into line with the major exponents of radical right-wing populism in western Europe. Whereas Umberto Bossi's Lega Nord wanted nothing to do with Jean-Marie Le Pen's Front National, Matteo Salvini has sought to rub shoulders with Marine Le Pen – hardly surprising given the ideational affinity with respect to migration, sovereignty and Islam between the two parties. The two parties also have a second thing in common. In both cases, success at the polls is to a significant extent an expression and reflection of the reemergence of an old parochialism vs. cosmopolitanism cleavage, which splits and polarizes both countries along a demographic – rural vs. urban – divide. It is in the small to medium-sized communities, particularly in the north east of the country, that the Lega traditionally has attained its most significant scores. Long gone are the days when the Lega Nord held the Milan city hall (Marco Formentini, mayor from 1993 to 1997). In 2018, the Lega trailed both the center-left Partito Democratico (PD) and the M5S in Italy's arguably most important economic centre. Both parties stand, at least in principle, for a relatively open society. Against that, under Salvini the Lega has positioned itself as the prime exponent – and defender – of what in Italian history is known as campanilismo – a self-centered focus on, and retreat to, the local, its traditions and customs. Historically, campanilismo stood for the rivalry between adjacent communities and the attempt to delineate oneself from the other; today, it stands for the exclusion of the culturally "other" – in particular migrants with a Muslim background. The Lega's reference to Judeo-Christian values and traditions, however, has little to do with religion, which after all preaches kindness to strangers. It is not without a certain measure of irony that Salvini's Lega has embraced the notion of Judeo-Christianity, given Italy's fast-paced process of secularization reflected, among other things, in one of western Europe's lowest birthrates. The Lega's reference to Judeo-Christian values and traditions, however, has little to do with religion, which after all preaches kindness to strangers. Rather, it is used as a marker of identity, intended to draw a sharp line against Islam. Given widespread skepticism with respect to Islam among the Italian public, the Lega's firm position on Islam has certainly contributed to Salvini's success. In 2016, more than two thirds of Italians thought that Islam was fundamentally incompatible with western values (Libero, September 2, 2016). The same year, a Pew study found more than two thirds of Italians having negative views of Islam. One year later, roughly 60 percent agreed with the notion that Islam represented a threat to the country. Anxiety in the face of the growing visibility of Italy's Muslim minority groups is one reason for the success of the Lega's populist mobilization, yet certainly not the most salient one. Far more important, however, are structural and particularly psychological factors. Structurally, Italy is among the advanced capitalist countries with the highest level of inequality and concentration of wealth, and with the lowest degree of intergenerational mobility, almost on a par with the UK and the USA. Both inequality and wealth concentration have grown since the financial crisis of 2008, but also because of growing pressure from import competition from China and from accelerated automation, particularly in the manufacturing regions of northern and central Italy, which also tend to have relatively high levels of resident migrant populations. It was in these regions that voters came out in support of the Lega "when they saw trade and technology resulting in economic decline and increasing inequality." Structurally, Italy is among the advanced capitalist countries with the... lowest degree of intergenerational mobility, almost on a par with the UK and the USA. Unease in the face of rapid technological innovation paired with the experience (or anticipation) of downward mobility (aka "positional deprivation") have throughout the western world engendered widespread malaise and pessimism with regard to the future. In Italy, these sentiments appear to be particularly pronounced. In 2017, more than two thirds of respondents thought their children would be worse off than the parents; 70 per cent expressed fear that their lifestyle was threatened; nine out of ten thought politicians were corrupt; and almost 80 percent said they neither trusted the government nor parliament nor the media. The resulting mix of political alienation and general gloom has been an ideal breeding ground for populist agitation – both on the right and on the non-traditional left (aka M5S). From this perspective, the first populist coalition government in western Europe was perhaps unavoidable. But will it save Italy? Doubts are in order. In the first weeks and months as interior minister, Matteo Salvini has scored big with his intransigent stance on the refugee/boat-people crisis. In fact, between March and July, support for the Lega went from 19 to 31 per cent, thus virtually at the same level as M5S. Salvini's rise in the polls might have never happened had the European Union done more to support Italy both politically and financially with regard to the migration crisis. Instead, there were widespread sentiments that Europe had "betrayed" the country, leaving it to deal with the crisis on its own. Salvini's hardline posture on migration has dramatically boosted his popularity. The migration question is a significant, but hardly a life or death issue for the M5S/Lega coalition. Governments in advanced capitalist countries are largely dependent on the goodwill of the international financial markets. Populist governments tend to spend money rather lavishly, as numerous examples from Latin America have repeatedly shown. The Italian government is no exception. Before the election, the Lega promised lower taxes and the introduction of a "flat tax", M5S the introduction of a guaranteed minimum income or "citizen wage" (reddito di citadinanza). Although the new government quietly benched the proposals, they left investors with a strong sense of fiscal irresponsibility. The consequences have been sobering. Within days of the inauguration of the new government, Italy's risk premium – the spread between 10-year Italian bonds (ITAGER10) and 10-year German bonds (bund), which serve as the benchmark – started to rise, at one point soaring above the 300 basic-point mark, setting off alarm bells among economists. Speculations were raised that the new government might be tempted to turn to China as a buyer of Italian sovereign debt. The Lega, of course, has its own solution to Italy's financial problems. In accord with its "common sense" slogan "Prima gli Italiani" the Lega has promised to rigorously cut social benefits for migrants. This is nothing new. Already in 2017, the regional council of Veneto passed a law that was meant to restrict access to communal nursery schools to families who had been living and working in the region for at least 15 years. With this law, the region's Lega Nord governor, Luca Zaia, sent a signal that his campaign slogan of 2010, "Prima i veneti," was more than an empty phrase. Zaia defended the law, maintaining that it has nothing to do with racism. It was just "common sense." The Lega's excitement over its nativist experiment, however, was of short duration. In May 2018, Italy's constitutional court declared it unconstitutional. The court argued that the law violated the principle of equality since it introduced "an irrational criterion for the allocation of the benefit" given that there was "no reasonable correlation" between long-term residence in Veneto and need. It is perhaps not unreasonable to expect that any attempt on the part of the Lega to pass its nativist agenda of "national preference" is likely to meet the same fate as Zaia's law. Nor is it entirely unreasonable to expect that Italy's populists in power, caught between international financial markets and the constitutional court, will end like many governments before them – mugged by harsh reality. But then, in Italy, everything has to change for everything to stay the same.